05 FebBear Market Noise or Reality Panic? Friday hurt. Today hurt more. The market just closed with losses of 4% across the board. Is this the beginning of the end or an overdue exhale? 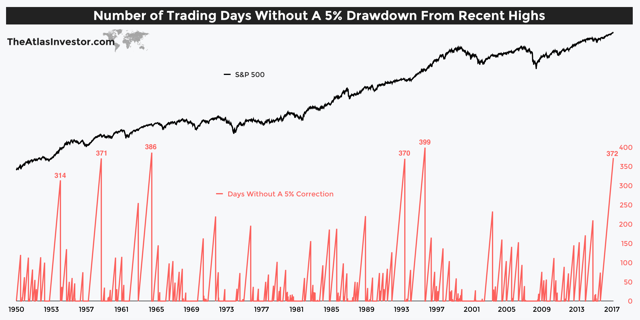 United States equities have now rallied approximate 420 trading days (372 for the chart below), or almost 18 months, without a -5% correction. This is very rare. We’ve seen and enjoyed this rally for sometime… and its been nice, well, better than nice. Markets were overdue for “nice”. With very low volatility readings on the VIX (the market’s “fear gauge”) for nearly 2 years. The days of the VIX averaging 18+ days are a distant memory and are still far off in the distance. I like Art Cashin’s sentiments from 3:45 today from the floor of the NYSE likening this market event and days to come to that of having open heart surgery; Today hurts, as would surgery day. As the patient recovers, its a day to day assessment; can I walk up the stairs today, can I go outside, etc. Until the patient re-establishes a base where they’re comfortable, they’re advised to take it easy and not do anything out of the ordinary. And so it should be for investors. Yes, erasing January’s returns is painful, but it offers perspective doesn’t it? January, erased, but it’s only one month. How did 2017 end for you? Or the last 9 glorious years? This brings me to a few takeaways for investors that you won’t like reading; its not fear and loathing, sell sell sell, bear market drama. Nope. Nil, sorry. Trust, Gratitude and Quiet the Noise. If you’re looking for a nugget to take action on or a cocktail party tidbit (go with the VIX piece above!) that helps you feel connected to your portfolio; you won’t get it from the rest of this post. Instead re-read the first 300 works and study the graphs. Here forward, is the real stuff; Don’t skip steps in life. We wake, meditate and set our sites on achieving a few things in our day. We’re thankful, certainly, but are we really? Are we grateful enough to recognize that we were even able to get out of bed? Or grateful perhaps that I’m not arranging a funeral for a loved one, or scheduling chemo treatments for a spouse? Do we overwhelm ourselves with the the media soundbite or the trending Facebook Instagram topic du jour? Or are you good at quieting the noise? Quieting the noise is paramount now. Quieting the noise can only be easy if you TRUST your portfolio’s/retirement plan’s position or the team managing it. Not easy? Get Trust. Trust is personal, only you know how to get it. The path of the Liberated Investor is a great 4 step formula to trust and yours for the taking. Assessing your investments first from a place of gratitude sounds hokey—but I promise this works–then, ensuring you Trust in your Plan and your investment allocation will make quieting the noise easy. Inflation is here to stay, interest rates are rising, and stocks just got a little bit cheaper. S&P earnings are up over 17% over from last year. The US just got a tax bill passed that will offer major support for many years to come. Its a mixed bag, to be sure. Take a walk, look around. Find your children, tell them you love them and treat them to a nice dinner with smiles and big tips for your server. Buy a puppy. Go abundant. Watch the magic. Then, tomorrow email or call the financial sage in your life for some perspective, and perhaps a much needed check-in. Give some gratitude, get some trust and quiet the noise. Lather, rinse repeat. I’m off to my children, and my puppy. No dinner plans, but we’ll take a rain check.